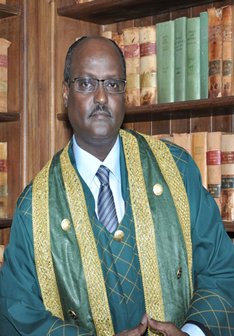 Justice Mohammed K. Ibrahim was appointed a judge of the inaugural Supreme Court of Kenya on June 16, 2011 after an open and competitive interview. Until then, Justice Ibrahim had been a High Court Judge since his appointment on May 22, 2003, serving in Eldoret, Nairobi and Mombasa. He obtained his Bachelor of Laws degree from the University of Nairobi and was admitted to the Roll of Advocates on the January 11, 1983. He practised law at Messrs Waruhiu & Muite Advocates, where he was admitted as a partner in 1985. In 1994, he established Mohammed Ibrahim & Associates, which subsequently expanded to become Ibrahim & Isaack Advocates in 1997. He has served as a council member of the Law Society of Kenya and a board member of a non-governmental organisation, Legal Education and Aid Programme (LEAD). Justice Ibrahim was actively involved in civil rights advocacy at the advent of the pro-democracy movement in Kenya and was detained without trial in 1990.